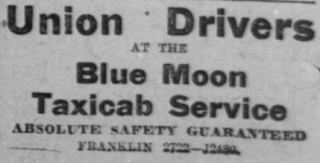 For most of the Twentieth Century, taxicab drivers in San Francisco were represented by the Chauffeurs' Union, Local 265 of the International Brotherhood of Teamsters, founded in October, 1909. The Chauffeurs' Union faced many troubles in its first year of existence. There was a turf conflict with the old Hackmen's union, which was faced down with the aid of the Labor Council; there was competition from the "Professional Chauffeurs' Association," a fake "union" invented by garage owners and the auto industry in order to keep drivers from joining the real union. By the end of 1910 local 265 was nevertheless ready to take on the five biggest taxicab companies in the city, starting on November 28, 1910. 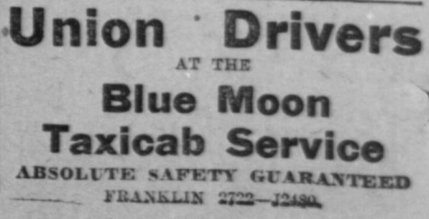 Drivers at that time were earning a commission of 20% of the meter, which rarely came to more than $3 (about $70 in today's money) for a 13 hour shift; out of this they had to pay for their own gasoline. The strikers demanded a daily wage of $3.50, free gasoline, and a closed shop. Although Only 100 Men Are Involved In San Francisco Taxicab Strike, a Half Dozen Arrests Have Been Made and Score Shots Fired. San Francisco, Cal., Nov. 30.--Although not more than 100 men are involved, the strike of the taxicab drivers, which was inaugurated here Monday night, already half a dozen arrests have been made and a score of shots fired. President Carl Dreger of the Chauffeurs’ union and five other union men today were admitted to bail, following their arrest for alleged stoning of a nonunion cab. The police are investigating a shooting affray at the same corner early today, in which Richard Kemp, a non-union driver, emptied his revolver into a crowd of union sympathizers who had stoned his cab, breaking his windshield and the glass door of the body. Two women were in the vehicle at the time, it is said. The drivers are standing pat on their demand for 20 per cent of the cash fares and free gasoline. Three of the five companies against which the strike was instituted have given in. The strike lasted for two weeks and ended with a compromise. Drivers got their free gasoline but remained with 20% of the meter; while some small companies unionized, the two largest companies (Taxicab Company of California, and Pacific Taximeter) kept the open shop.